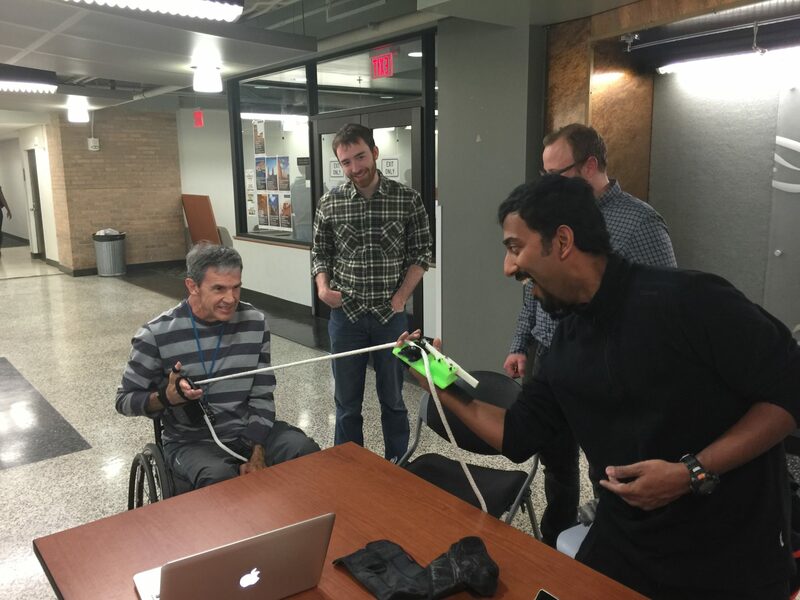 The rope gripping device was born out of a very unique problem statement: To enable a C7 Quadriplegic para-athlete to effectively manage a solo sailboat by providing an optimal method of gripping sailing ropes. Our team has been in touch with an inspirational 'customer' for this concept, who will eventually use this device to improve his sailing. Quadriplegia (tetraplegia) is caused by damage to the cervical spinal cord segments at levels C1-C8. Damage to the spinal cord is usually secondary to an injury to the spinal vertebrae in the cervical section of the spinal column. The name arises out of the fact that all four limbs of the person are affected. The legs are completely paralyzed and the arms are partially affected depending on which segment of the neck received the injury as seen in the list to the right. So in the case of a C7 Quadriplegic, all the functions of C1-6 are normal. The functions of C7 are impaired to varying degrees, and those of C8 and below are usually completely impaired. To say that more simply, the movements of the arm are normal, and so is the ability to extend fingers as well as move the wrist. However, the flexing (or gripping movement) is almost absent. The only limited control here is a weak gripping movement of the thumb. This means that a C7 Quadriplegic who is a sailing enthusiast or para-athlete would be strong enough to handle the ropes and maneuver a sailboat if only he were given an effective method of gripping ropes. 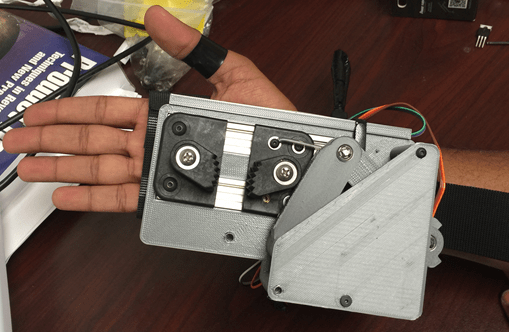 In the specific case of our customer, the arms have enough strength to lift 50 pounds of weight if transmitted to the wrist, but the fingers would barely support a single pound. A simple rope gripping device would be able to fulfill this need allowing him full use of his arm's strength. C5 also supplies the shoulder muscles (deltoid) and the muscle that we use to bend our elbow (biceps). C6 Bends the wrist back (extension), and externally rotates the arm (supinates). C7 Straightens the elbow and wrist (triceps and wrist flexors) straightens fingers, pronates wrist. C8 Bends the fingers (flexion). Injury below the cervical spinal segments will result in paraplegia, since the arms would be fully functional, but the legs completely paralyzed. Capable of gripping sailing lines of varying sizes from 3/8in to 1/2in with a pulling force of 50 pounds. Pulling force of the rope is to be transmitted to the wrist and not the fingers. The signal input can come from small movements of the thumb. Compact and lightweight device that is easy to remove and put on even during sailing without assistance. Durable and water resistant since it is to be used in a wet and salty environment. Ability to be continuously used for a minimum of 4 hours of sailing, preferably for a full day without recharging. Ability to grab the rope fairly quickly and release it instantly if needed. Have as few hooks or sharp edges that would accidentally snag a sailing line. where r represents a radius from the input or output force relative to the instant center of rotation and ω represents the angular velocity of the input or output link. As the input link (handlebar) rotates the fourbar into a toggle position, the output link's angular velocity tends to zero. According to the above equation, this causes the mechanical advantage to tend toward infinity at this point. This enable the joint to "lock" once movement slightly beyond the toggle point is reached. This feature was utilized for holding and gripping the rope. 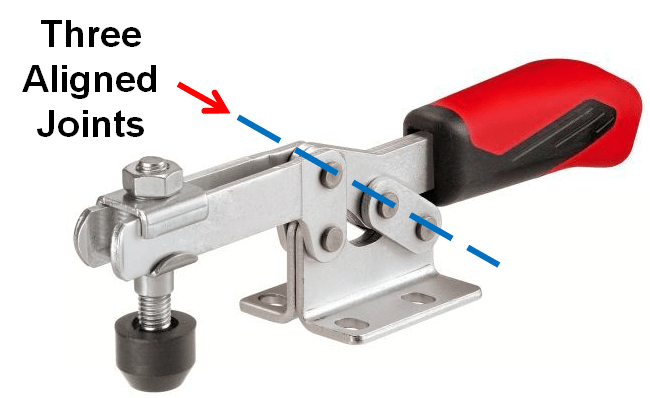 Another mechanism that the developed device utilizes is the cam cleat. This is the same concept sail boats already use to hold the ropes on the boat itself. 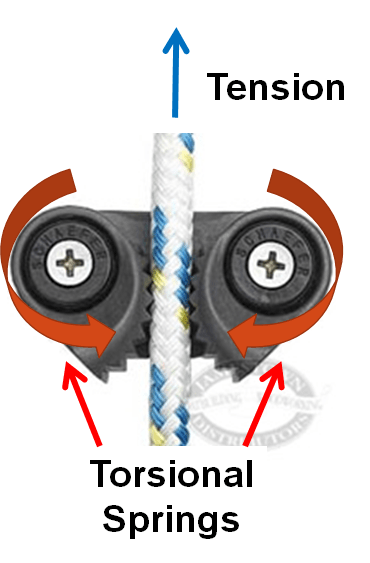 If a rope is pulled in tension one direction as seen in Figure 2, the internal torsional springs of the cam cleat create a compression force to grip the rope. As more tension is applied to the rope, the torsional springs are able to apply more gripping force to the rope itself. This enables powerful rope holding ability without the need for external, powered force generation. The first prototype consisted of a four bar linkage that opened and closed the jaws of a cam cleat. Velcro straps were utilized about the wrist to attach the device to the user. As shown in Figure 3, the design is meant to be motorized to enable a powered gripper for the impaired user. A tie rod was going to be used to to attach a servo motor horn to link 3 (L3). In the design process of this mechanism, it was assumed from the requirements that a 100 Newton clamping force on the rope would be enough to fully drive the mechanism to the toggle position. The free body diagram of this condition is shown in Figure 4. 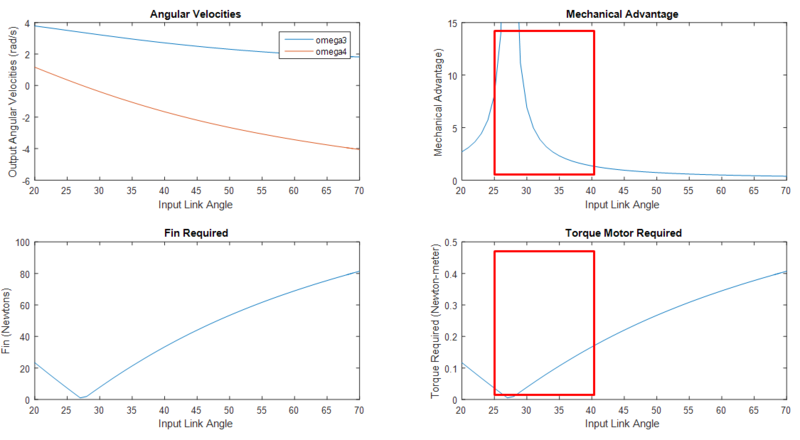 Using this assumption, the mechanical advantage calculation described earlier in the Design Requirements and Theory section was used to find required input torque from the servo motor. The results of this analysis is shown in Figure 5. 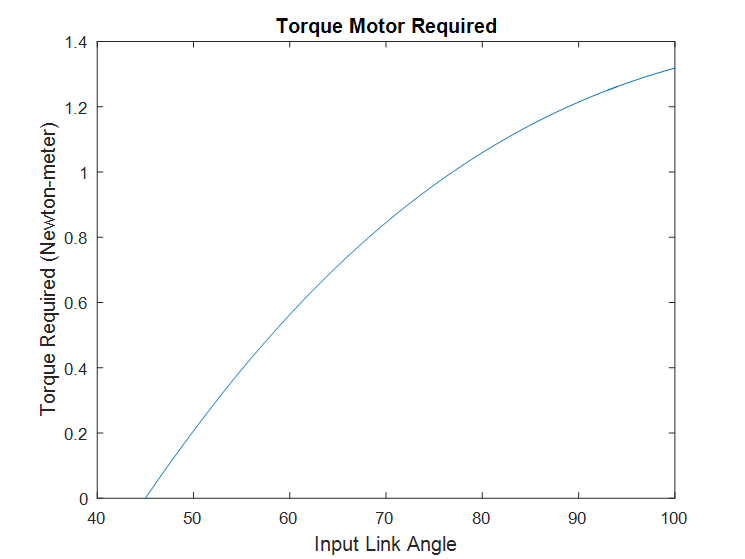 The main impression obtained from the kinematic analysis of this first design is that the motor torque requirement was very low. Most servo motors could provide the expected required input of less than 0.5 Nm. Top Left: Relative angular velocities of L3 and L4 if L2 is moving at 1 rad/s. Top Right: Mechanical Advantage spikes to infinity near the toggle position. Bottom Left: Tie rod force input required on L3 to generate 100 N output compression force on the rope. Bottom Right: Torque required by the motor assuming the tie rod is connected to a 5mm radius servo horn. The next design iteration included the integrated motor rather than just simulating it previously. Since general cleat and four bar features stayed the same, the relative kinematics presented for the first design also apply to this case. However, there were some design changes to obtain Design II shown in Figure 6. First, L3 in Design I was very large, so this was eliminated in Design II to make the device more compact. Also, the motor was integrated with this design, but the tie rod was not used to reduce complexity of the system. Alternatively, the team chose to impart a direct torque on L2 using the servo motor. Lastly, the grip operation was blind when reaching and grabbing for ropes due to the orientation of the cleat sliders. This was rotated 90 degrees in the new design, which allowed the user to have a different hand position that was more natural for rope gripping. The design change of making the linkage system more compact did not affect the kinematics significantly. However, the torque input required by changing the servo motor's input method from a tie rod to direct input on L2 had a significant impact. 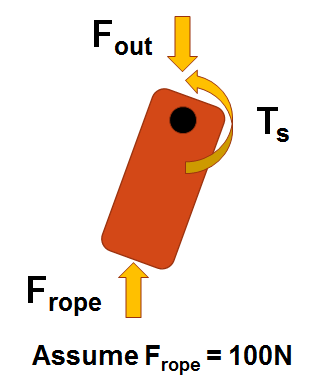 Figure 7 shows that the torque input requirement is much higher for the working range of where the rope contacts the cam cleat. Even though the torque output required by the motor is higher in the new design, it is still well within the maximum output of the servo motor chosen for the product of 1.7 Nm. If we had chosen a weaker servo motor, the original Design I would have been the only feasible option. Figure 6 shows the mechanism in its completed form. Another key factor with this final design was the addition of a case over the mechanism. This would prevent any unwanted snags with the linkage while operating complex movements during sailing. Figure 8 also shows the chosen actuation method for this design. 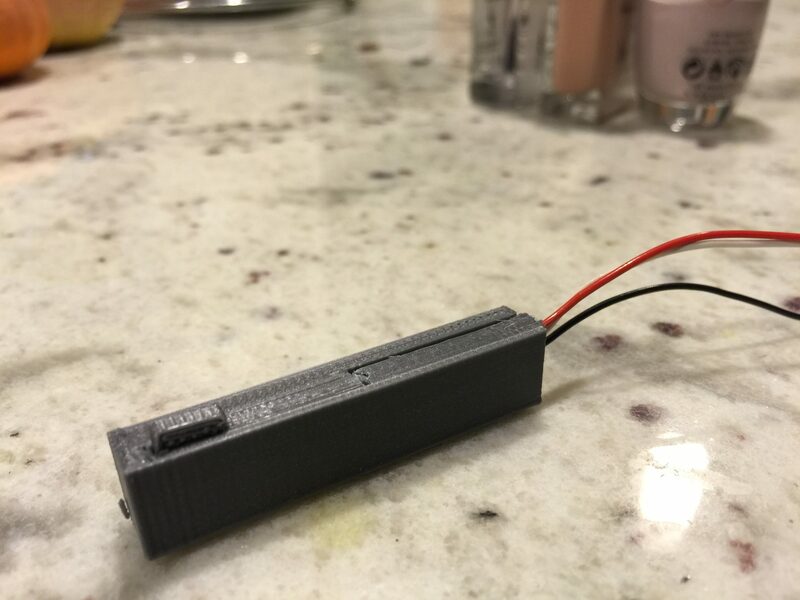 A Hall effect sensor was embedded into the top corner of the 3D printed plastic, and when rising edge signals are generated and sent to a microcontroller, the device can open and close via the servo motor on command. Having a magnetic ring attached to the thumb of the user allows him or her to tap the corner of the device and cause the servo to move to the opposite of its current state, which could be open or closed. The toggle switch logic was designed to work the same physically for both opening and gripping on the rope. The team developed a mechatronic system in order to minimize the effort required for the customer to use the product. A servomotor was utilized to provide the torque necessary to engage and disengage the cam cleat. The servomotor was a Power HD High-Torque Servo 1501MG purchased from Pololu and capable of generating 17kg-cm of torque. A hall-effect sensor was utilized to signal the servomotor to engage or disengage the cam cleat. The hall-effect sensor was integrated into the base of the prototype so that it would be shielded from elements such as water which could short out the sensor or cause interference. Input from the hall-effect sensor and output to the servo motor was controlled by an Arduino Uno, which was provided as part of the RMD Supplies kit.The full circuit is shown below in Figure 1. In order to implement this circuit successfully, a pull-up resistor would be required between the output of the Hall effect sensor and ground. In addition, resistors should be selected to appropriately bias the transistors such that they are operating in the saturation region. Finally, a momentary switch would have to be implemented to momentarily short the collector and emitter of Q2 in order to power on the Arduino. A high-density lithium polymer battery sourced from a Samsung Galaxy smartphone was selected to provide power to the system. The battery was chosen for its unparalleled energy density which allowed for an estimated four hours of continuous use in a package that could easily be contained within the base of the prototype. A buck-boost DC-DC converter was used to step up the voltage from 3.3v to the 5v required to run the servo motor, hall-effect sensor, and Arduino. The battery was charged via a simple lipo charge circuit. 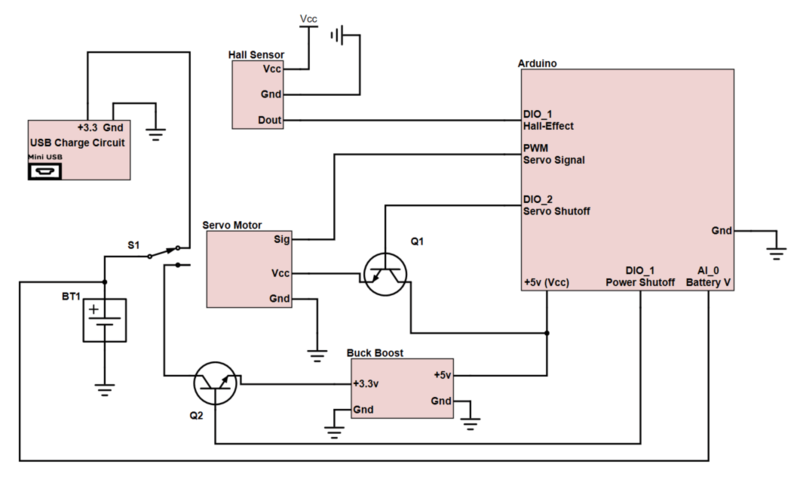 Out of concern for safety,a battery voltage monitoring scheme was designed such that it utilized a NPN transistor as a switch to maintain voltage to the buck-boost converter. In this design, battery voltage was monitored by the arduino and shut off if voltage became low on the battery. The team utilized an Arduino Uno to control the mechatronic components of the system. In the main loop of the code shown below, the Aduino first checks the state of the Hall effect sensor. When the user puts a magnet in proximity to the Hall effect sensor, its state changes from high to low. When the magnet is removed from the sensor the state changes from low to high. Upon a transistion from low to high, the code checks the servo position and commands the servo to toggle to a different position. The first time a magnet is brought close to the sensor and removed the gripper mechanism will close. If the process is repeated the mechanism will open. We utilized this logic so that the user only has to tap the side of the device with a magnet to get the gripper to open or close. The code shown below was compiled to the Arduino to demonstrate the prototype, and a more robust code that includes voltage monitoring is in progress. The team decided to utilize fused deposition modeling (FDM) based 3D-Printers to construct the majority of the components for the rope gripping mechanism. The main advantage of this technique was that it allowed for rapid and inexpensive prototyping. Most components of Design II were redesigned, printed, and tested at least two times. The ability to almost effortlessly generate functioning prototypes allowed the team to rapidly improve the device and incorporate changes that would have otherwise been too costly in terms of time and money using other prototyping methods. 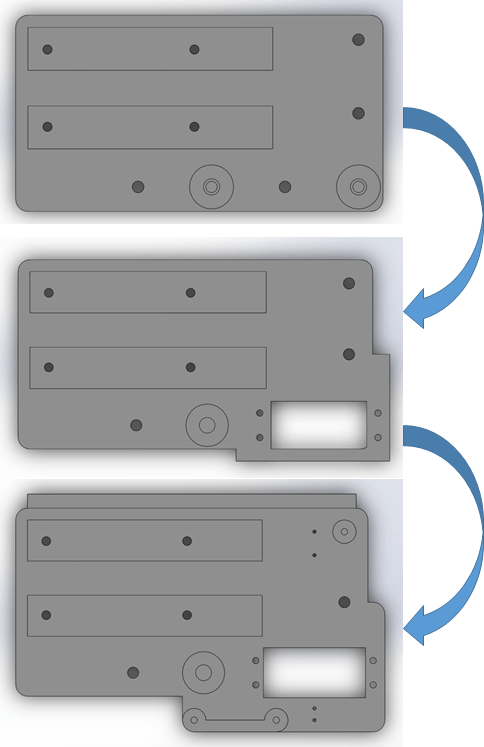 The various iterations of redesign for the base plate of the gripping device are shown in Figure 10. 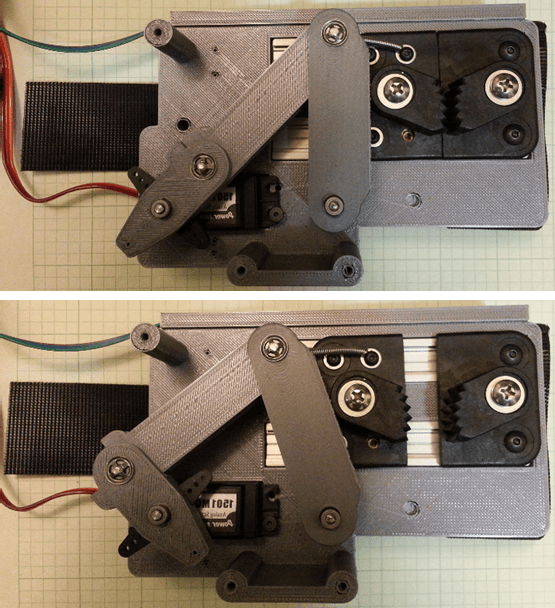 The second redesign for the baseplate incorporated a mount for the servomotor and the third redesign allowed for a cover to enclose the linkage arms and servo. 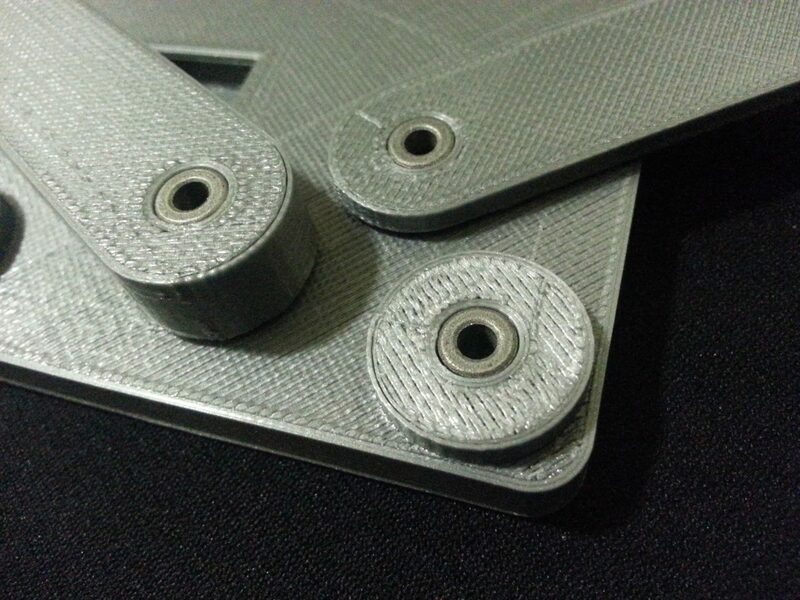 The primary challenges of using FDM printers approach were quality and performance of the prototype parts. Strategies for improving FDM print quality are addressed in the 'Printer Calibration' section below. Performance of the product was maximized via part redesign and rigorous testing. From experience the team learned that parts fail easily when in tension in the axis intersecting the printed layers, and future parts were printed with an orientation that minimized this mode of failure. Additionally, harsh tests of the prototype were utilized to find weak links in the mechanism. The most common quality problem encountered during the project was consistently undersized holes. Undersized holes were compensated for with the aid of a calibration sample. The sample consisted of 95 holes with five holes for each expected diameter between 1.0 and 10 mm in 0.5mm increments. Hole diameters were measured and recorded using digital calipers at room temperature. The average error for each diameter was plotted and a quadratic regression was fit to the data. The plot as well as the polynomial regression terms are shown in Figure 11. The regression terms were used to add an offset to each hole diameter on parts to be printed. The bushings press-fit into the plastic in Figure 12 are representative of typical results using the calibrated hole sizes. The smooth motion of the prototype is largely attributable to the use of oil impregnated sintered bronze bushings as bearings to support radial loads. The bushings shown in Figure 12 were press-fit into seats in the links. The seats and the slight interference of the fit prevented the bearings from slipping out of the links. Precision shafts were cut to size and used as pins to constrain the links. The pins were locked in place using retaining rings. Linkages were designed so that the distance between the outer edge of the link and the outer diameter of the bushing was greater than or equal to the diameter of the bushing. This geometric constraint proved sufficient for preventing tear-out in the linkage arms. 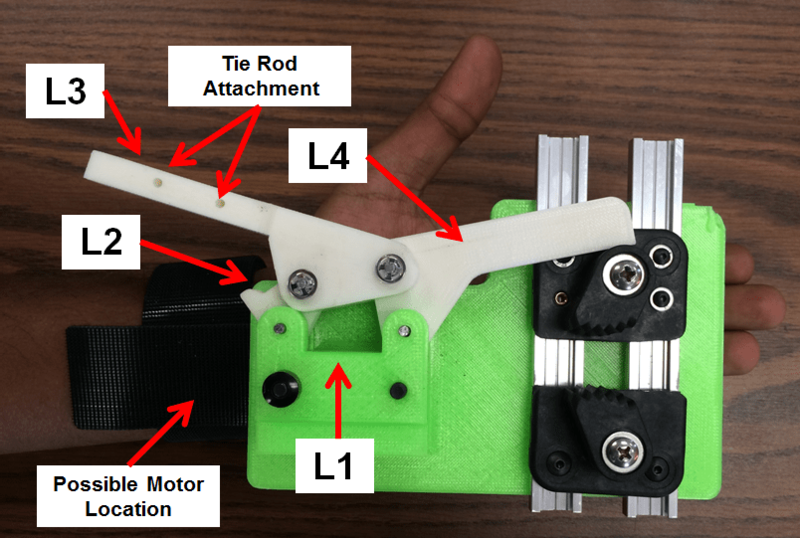 The team plans to continue developing the assistive gripping device with the ultimate goal of fully integrating all mechatronic components into the base of the mechanism. One of the advantages of additive manufacturing is the ability to easily enclose components such as sensors and wires. Mechatronic elements such as the servomotor and hall-effect sensor were integrated into the base of the gripper prototype and all wires were routed through channels incorporated into the base-plate. Integrating the hall-effect sensor into the base in an enclosure similar to the one shown in Figure 13 makes the prototype more visually pleasing and more importantly protects the sensor from abrasion and debris. Wire channels have similar advantages with the additional benefit of preventing the wires from being snagged as the device is in use. Throughout the project, the team worked closely with the customer to ensure that the assistive rope gripping device would meet the customer's requirements. The ultimate test of our prototype occured when we invited the customer to try the product for himself. Securing the prototype to the customer's hand was a straightforward process that took less than one minute. The customer commented that he would feel capable of fitting the gripping device to his hand with the inclusion of metal rings to aid with strapping the Velcro. The customer's thumb mobility was more limited than anticipated, but the Hall effect sensor used to close and open the mechanism proved to be operable nonetheless. Images of the fitting process and customer first impressions are shown in the photo gallery below. Two important objectives of the project were to enable the customer to grab a rope with minimal effort and to provide substantial gripping force on the order of 50 lbs. In order to demonstrate the prototype's ability to meet these objectives, the team requested that the customer engage a rope and pull against a team member equipped with the first prototype design. This demonstration is shown in Video 1. The video demonstrates that the assistive gripping mechanism can be used to easily grab a rope and secure it against considerable forces. 1) Pay attention to the proper use of fasteners: The group was successful in implementing retaining rings on the Design I and Design II prototype. The pin joints connecting most of the links of the four bar linkage was fixed in place with these rings. However, the fact that these mechanical components were designed to rest in a groove on the pin was ignored. Without a groove, it was very difficult to assemble the joints of our four bar linkage since the ring had to be bent to accommodate a slightly larger diameter. The retaining ring functioned well once in place, but the appropriate groove would need to be added if the product was to be mass produced for ease of assembly. 2) Identify Manufacturing Limitations: The group initially faced problems with quality of 3D-printed parts. 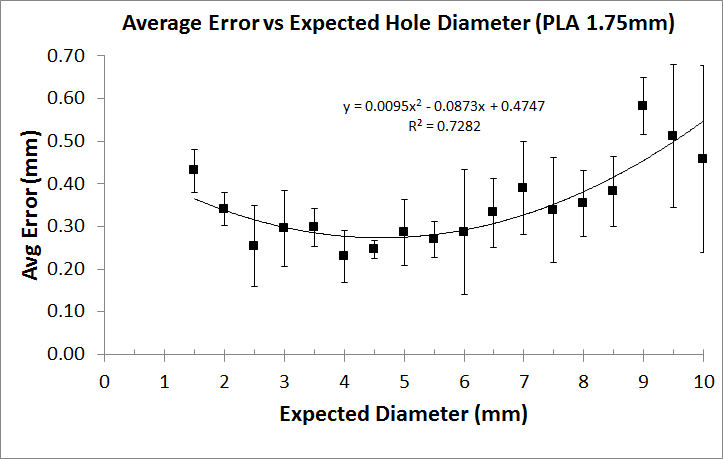 Holes were consistently undersized and the group found it necessary to perform a calibration print to determine proper offsets for hole sizes. Other calibrations were necessary to select an appropriate temperature, print-speed, and layer thickness. Once these machine settings were determined the team saved them and consistently used the same printer and the same spool of plastic to print parts. While calibration was a time consuming process, it was a necessary step for producing FDM printed parts with consistent, high quality features and finishes. 3) Understand Customer Needs and Check-In Frequently: An essential aspect of the product design process is frequently touching base with the needs of the target market. This is especially so when the designer does not have first hand experience in the shoes of his customers. Many significant design iterations were the result of feedback from our customer. The choice of input signal - Able bodied users have no dearth of methods to activate a device using various motions of their fingers to push buttons, turn dials or move sliders. However, our customer had a very limited set of feasible movements that have sufficient fine motor control. Sharing the version 1 prototype with him allowed us to narrow down the thumb movement as the only feasible choice of input for a mechatronic system. The thumb had very little physical strength, but it was still capable of fine control. Methods of attachment - Attaching a strap or brace onto our own hands may seem like a trivial, everyday task, but for our target customer, any operation that requires him to grip or adjust a strap is rather difficult. Interacting with him and observing his methods of handling other objects allowed us to design a device that was actually usable by him. All our velcro bands are designed to have rings at their end for him to put his thumb through and pull. The movements to put the device on and off are also designed to be done with minimal finger control. Minor feedback like this was what made it possible for him to see and put on the final prototype for the first time during our public demonstration and beat an able student at a tug of war with minimal adjustment to the product. In Conclusion, the group is happy to have demonstrated a working prototype that was able to perform its function with its intended user, and we hope that, with minor adjustments, it will be possible to use it for solo sailing. A huge shoutout to Mr. Paul Horton for being an inspiration, a great customer and an absolute pleasure to work with! We also thank Dr. Deshpande and Taylor for the support and direction given, and we thank the rest of our class for the fun demonstrations and other cool products that we were able to see.